Enjoy a home-cooked meal or just a bottle a wine around the Palmetto Outdoor Dining Set. The unique dining table features a double pedestal base with a perfectly sized table top. Covered with a thick glass top, the table top allows for easy cleaning and enough room to layout your meal for anyone who's ready for seconds. Six arm chairs are included and everything is built to withstand the elements, so don't worry about mother nature. With a loveseat, two chairs, and a cocktail table you'll be able to entertain guests with ease. We love mixing in some fun outdoor pillows for a burst of color, but you can truly create your own look with whichever accessories you use. 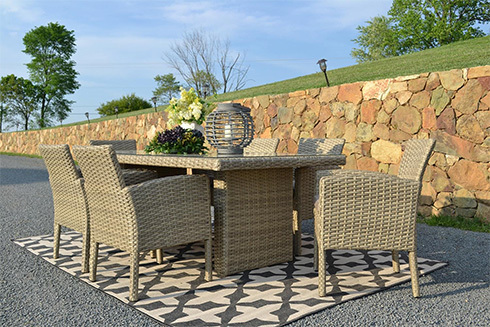 This transitional outdoor furniture set is perfect for a patio, deck, or even a lawn! Relax in comfort with friends and family as you gather to watch a movie, enjoy some cocktails, or just get some sun! With one armless chair, two armless chairs, one ottoman with cushion, and one cocktail table with glass top, there are plenty of different configurations you can try with this sectional set. Enjoy the outdoors in comfort with the Palmetto Outdoor Furniture Collection - available at Belfort Furniture. These collections are in-stock and ready for your home now! Shop online or in-store to bring this style to your home.